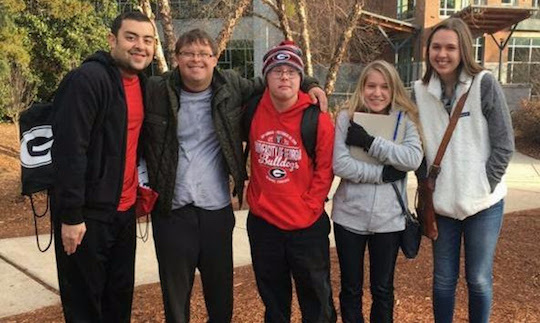 Launching this semester, Destination Dawgs is UGA’s first inclusive post-secondary education opportunity for students with intellectual disabilities. Over the course of five semesters, Destination Dawgs students take undergraduate courses and complete a non-degree certificate program that prepares them for transitioning to adulthood, having a career and independent living. How does the NMI come into play? The NMI has welcomed Melanie Charyton to the team who is facilitating a new media campaign for the Destination Dawgs program. This campaign aims to develop vital campus and community networks that will ensure the program’s long-term success. In addition, all 5 Destination Dawgs students are taking NMIX 4220 and 4221: Digital Brown Bag this semester. Alongside New Media Certificate students, the Destination Dawgs are exploring career trends and professional best practices. Each week, industry professionals visit class to share career insights and experiences and geek out about all things new media. You can find the Destination Dawgs on the 4th floor of Grady throughout the week working on their studies. Be sure to say hello when you see them in the NMI! For more information, visit the Destination Dawgs website or like them on Facebook!